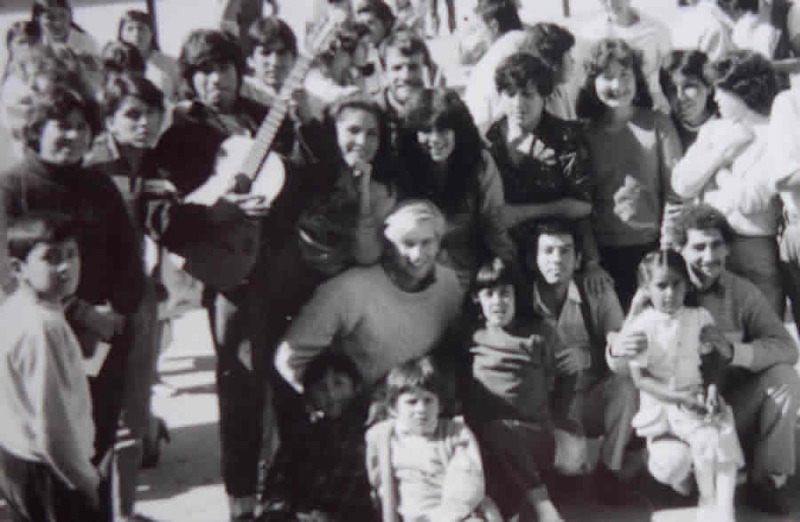 This photograph is a memento from Richard Resl's trip to Bolivia 30 years ago. He's surrounded by a group of young people in the main plaza in Tarija, Bolivia. Photo courtesy of Richard Resl. The blond-haired man standing in the crowd of young people in the Plaza Grande in Tarija, Bolivia, is a long way from his native Austria. Yet Richard Resl looks very much at home. A black-and-white photograph immortalizes this moment from 30 years ago, when Resl—just out of high school and on his first big adventure—looked up at the camera and smiled. 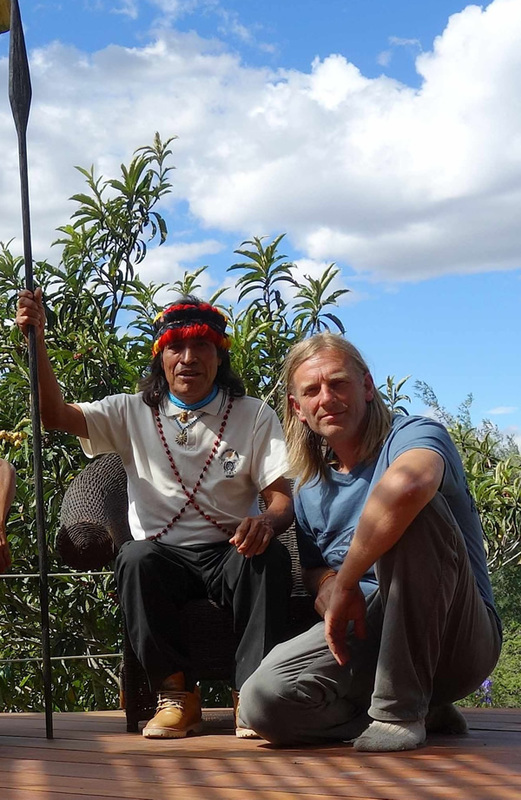 Resl has had many adventures since then, mostly in Latin America, where he has carved out a life helping indigenous people in Ecuador protect their land and way of life. A geographer who is passionate about his work, Resl runs the nonprofit AmazonGISnet organization. It's dedicated to teaching indigenous people from 11 nations how to use GIS and other geospatial technologies to create maps that can be used for everything from economic development planning to environmental protection. Resl raises the ceremonial spear in happiness as Ankuash and Dangermond shake hands in friendship. Resl and indigenous leader Domingo Ankuash, from the Shuar nation, were at the 2016 Esri User Conference, where they accepted Esri's Making a Difference Award on behalf of AmazonGISnet. The award was for the organization's work to support participatory planning among the indigenous communities as they strive to preserve their culture, create sustainable economic development opportunities, and protect the fragile environment in the Amazonian lowlands of Ecuador. How Resl came to live and work in Ecuador was serendipitous. In 1984 and fresh out of high school, Resl decided he wanted to go somewhere tropical, a place not in the vise of cold weather and the Cold War. He wanted to experience a new culture and be in touch with nature too. "There was this dream—I had to explore the world," said Resl. Resl found an affinity for the Amazon. 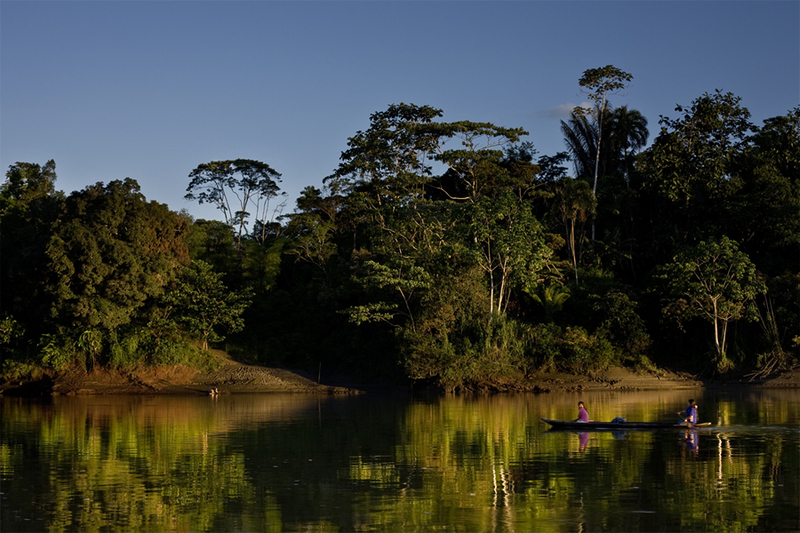 Here, a canoe skims across the waters in Yasuni, a rainforest in northeastern Ecuador that's the ancestral home to the Waorani people. Photo/Kelly Swing. 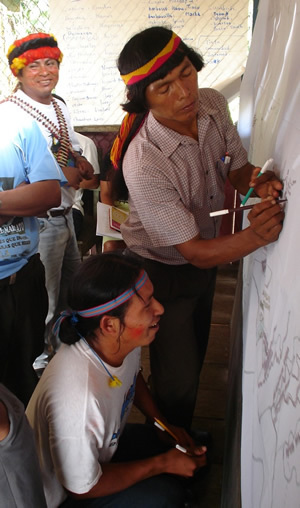 Richard Resl worked with members of the Shuar nation to measure the territories in Transkutuku, southeastern Ecuador. Photo courtesy of AmazonGISnet. A travel agent told him about an inexpensive flight to Peru. 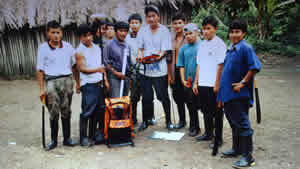 A group of Shuar leaders posed in 1998 with a GPS device that was used to help map their territory. Photo courtesy of AmazonGISnet. That first trip to Peru (with stops in Bolivia, Argentina, and Brazil) set the stage for what Resl would do with the rest of his life and where he would do it. "I fell in love with Latin America and the Americas. The people were so friendly," said Resl in a telephone interview from his office in Cumbayá, Ecuador, just outside Quito. When he returned from his post-high school trip to Latin America, Resl made a big decision. "I decided I wanted to become a geographer," he said. One day in 1988, while studying in Innsbruck, he saw a poster advertising a seminar on GIS. Intrigued, he attended and was hooked. "I thought, 'This gets into computer science.' "He went on to earn a master's degree in geography with specialization in GIS from the University of Salzburg, where Professor Josef Strobl became his mentor in GIS. Resl then attended the University of Washington in Seattle on a Fulbright scholarship to do postgraduate work toward a PhD in geography, studying under well-known professors Nick Chrisman and Tim Nyerges. 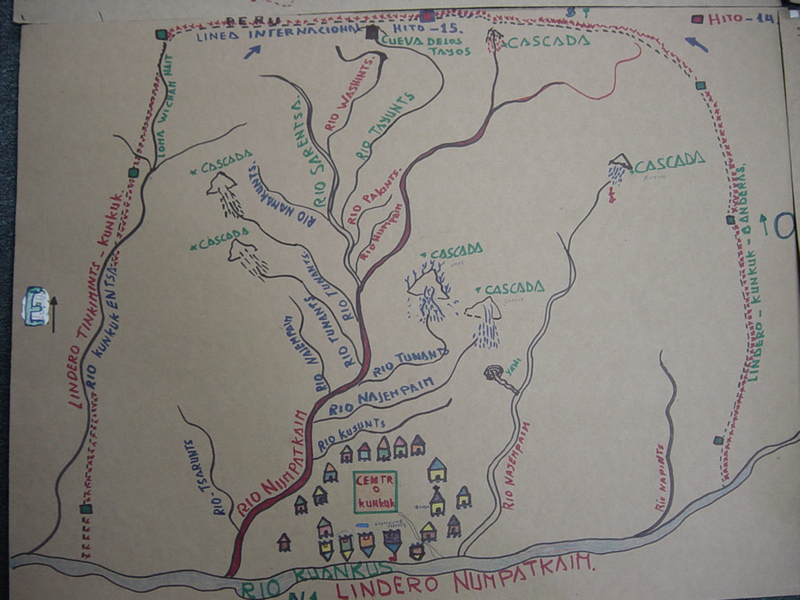 A hand drawn community map includes houses, rivers, and waterfalls in the territories in Transkutuku. Photo courtesy of AmazonGISnet. Then fate stepped in, inching him closer to a return to Latin America. Again, the young Austrian saw a note tacked on a wall in a university building. A physician was on campus looking for researchers interested in working in Latin America. The year was 1994. 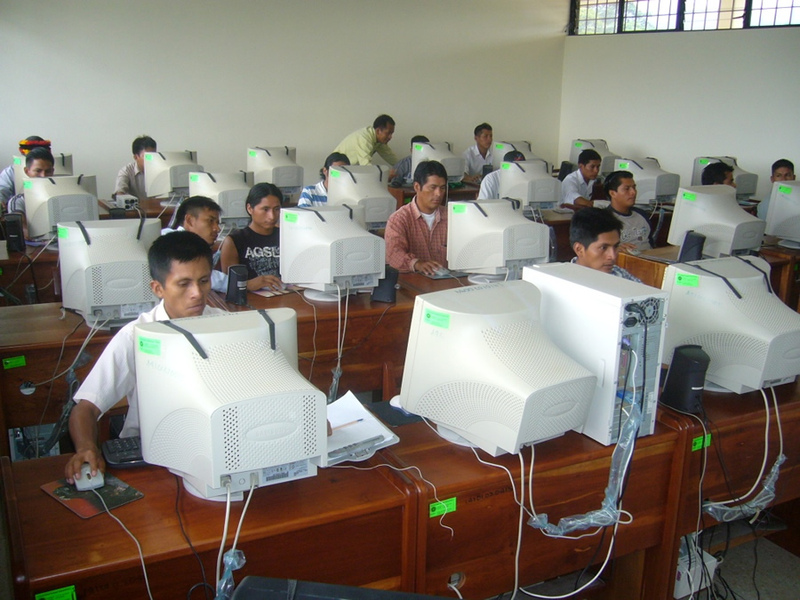 A group of indigenous students learn to use GIS at the AmazonGISnet lab. Photo courtesy of AmazonGISnet. Everything had come full circle, Resl said. The doctor wanted to hire a researcher with GIS knowledge to help with epidemiological research in Ecuador. The work involved studying where outbreaks of malaria and other mosquito-borne diseases were occurring, based on physical indicators such as if the infected persons were living near a pond or a lake or in a secondary rain forest, and social parameters such as living in an urban area with a sewer system or having a home with a grass roof. After Resl arrived in Ecuador, he soon began to branch into other areas besides health research. He worked to create a GIS database for the municipal drinking water and sewer system of the city of Quito. He got involved in a Danish government-sponsored foundation called DIVA, which studied biodiversity in relation to cultural diversity. Though he was becoming fluent in Spanish, he had another language that served him well. 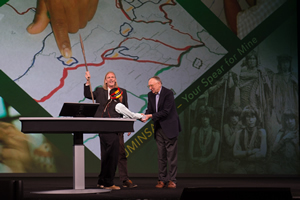 "GIS was my language to get to know people," Resl said. 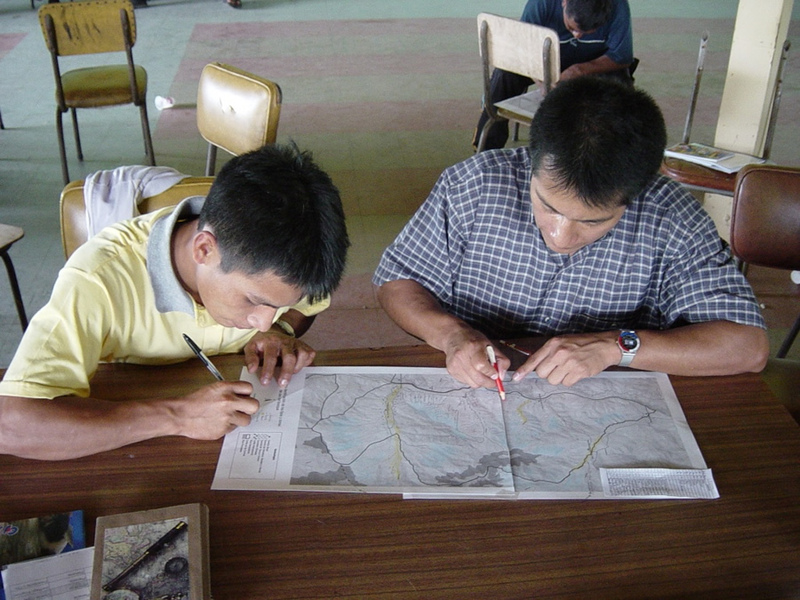 Young men create life plan maps in the Shuar territory of Cordillera del Condor in 2008. Photo courtesy of AmazonGISnet. Resl still vividly recalls the day in 1996 when strangers showed up at his house in Tumbaco, a small town with views of the volcanoes: Ilaló and—on a clear day—glacier-covered Cayambe. "They came from nowhere," Resl said of the small group of Shuar men, who stood outside and stuck a spear in the ground. "I couldn't really [figure out] what they wanted. I brought them water," Resl said. "Then I had them enter the house." Since Resl did not speak Shuar, he faced a conundrum: he needed to get work done, but the men would not leave. An idea came to him. He brought out a map and, in the language of mapping, asked, "Where are you located?" They pointed to a place on the map. "I could see they were eloquent in using maps," Resl said. Achuar leaders draw their land use maps. Photo courtesy of AmazonGISnet. It turned out that the Shuar wanted Resl to travel to their community. Three days later, he took an eight-hour bus trip to a small airport, where a charter plane (provided by a missionary church for trips the indigenous people needed to take) flew him into the Amazon region. He was the only passenger in the small plane piloted by a man who said he absolutely would not stay with Resl once they arrived at their destination. "It's quite dangerous," the pilot said. "I have an invitation," Resl replied. The view below was breathtaking. "We flew over a vast ocean of trees with no gap in between," Resl said. "It was a one-hour flight, almost to the Peruvian border." The pilot dropped Resl off at a small airstrip and, minutes later, was gone. "It was five in the afternoon, and I waited there for a half hour. I thought, 'I am really lost.' "
Suddenly the Shuar appeared. "I was so surprised. They were totally prepared," he recalled. "The whole community was there with a greeting ceremony." Darkness fell, and Resl grew uncomfortable as men with spears and painted faces approached him and told him to sit down. "I was really frightened." However, a young man who spoke Spanish told him to stay awake and accept all food and drink offered. "If they give you something to drink and eat, don't reject anything," Resl recalls the man saying. For 24 hours, Resl said he was observed and told to "defend yourself." He thought he was going to be on trial. Suddenly, people came up to him bearing gifts such as jewelry and other Shuar crafts and "11 or 12 spears." The territories of the Amazonian nations of Ecuador. 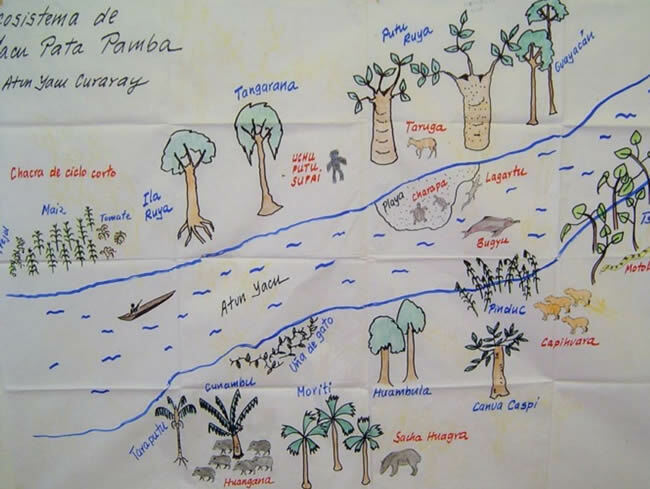 The Shuar knew Resl was a geographer and wanted him to map their land. They wanted to create a map of their territory to provide to the Ecuadorian government and to create a management plan for their community. 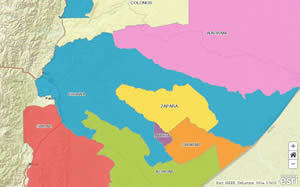 Indigenous rights had long been an important issue in Ecuador, with the Confederation of Indigenous Nationalities of Ecuador having been formed in 1986 to organize a group of indigenous nations in the effort toward gaining those rights. Resl knew that, with no roads and just jungle, the job of mapping a territory of 220,000 hectares would be nearly impossible. So he told the tribe the work would cost them $20,000. "I thought, 'They will now say no,' but they said okay." 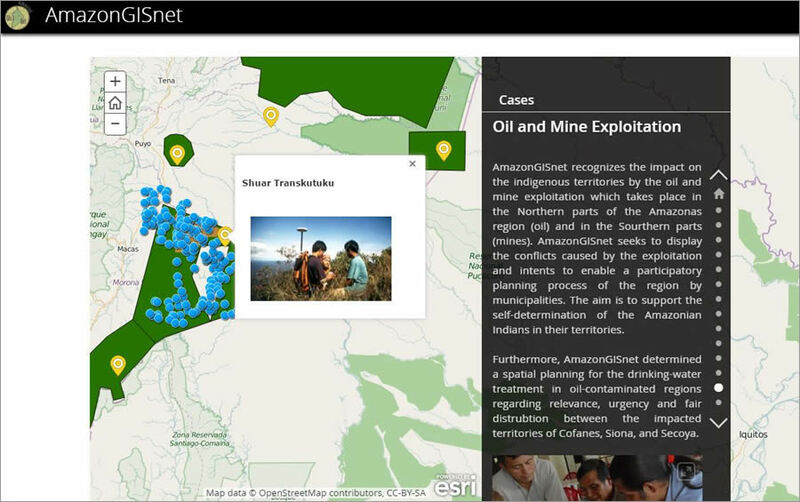 AmazonGISnet is teaching indigenous students how to make Esri Story Maps so they can tell stories about their territories and the changes occurring in the Amazon. Two years passed, however, before the Shuar returned to Resl's home in Tumbaco. "They said, 'We have the $20,000,' and, 'We need to go right now.'" Resl went down to the water department, where he was doing consulting work, and got two GPS devices and a satellite image of the area. He also recruited a friend, a German engineer, to accompany him for the first two weeks. A drawing of the Kichwa Amazonian ecosystem along the river Yacu Pata Pamba. 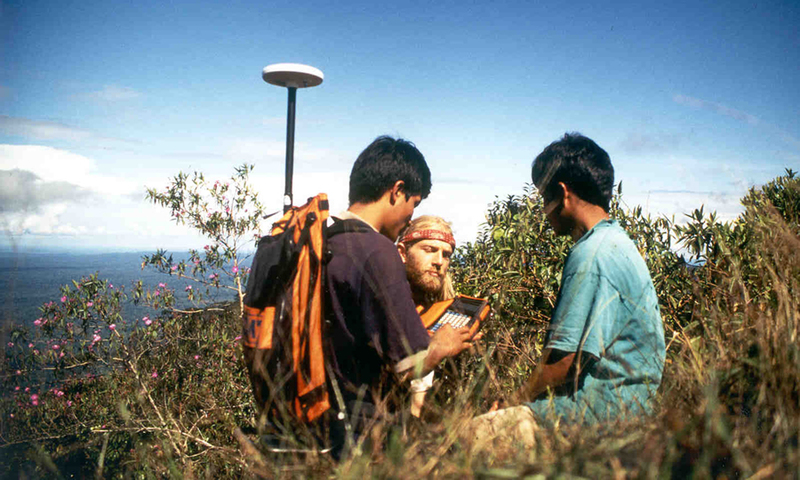 Working with a small team of Shuar men, Resl and the engineer spent weeks trudging through the dense Amazonian jungles, collecting waypoints on GPS devices. They lived off the land, eating small animals and fish. Back at his office, Resl used Esri technology to make a map that included the territorial boundaries (determined by using 60 waypoints collected with the GPS devices), the natural boundaries (from the satellite imagery), and biodiversity information he collected during his time in the Amazon. 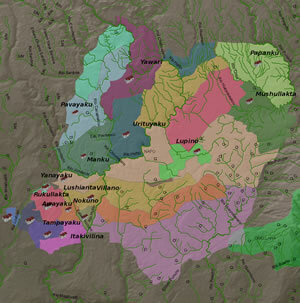 A zoning map that shows families and community centers in the Kichwa indigenous community. Resl later went on to do more mapping for the indigenous nations, and out of that grew AmazonGISnet. He is now the coordinator of this network of members from 11 indigenous nations who use GIS as a tool for land-use planning and management. AmazonGISnet offers training to indigenous students interested in GIS and other geospatial technologies. Resl said that one goal is for the young people to create "life plans" for each territory that incorporate maps. These maps show how space is used within the territory, including where the women grow crops, men hunt, families live, and environmentally sensitive land is located. The life plans also can include sacred and ceremonial sites. The students also are embarking on a project to create story maps, using Esri Story Maps apps, that they hope to share with the world via the web. This story map, created using the Esri Story Map Cascade app, explains AmazonGISnet's mission. AmazonGISnet plans to continue supporting the indigenous people from the Siona, Secoya, Cofán, Waorani, Kichwa, Zapara, Shiwiar, Andoas, Achuar, and Shuar nations as they try to protect their way of life. Changes are coming to the Amazon, with increased government-backed mining, oil, and logging concerns reshaping the landscape and how people live. Resl hopes the maps that the indigenous nations are creating with the help of AmazonGISnet will give these nations a stronger voice at the planning table when land-use decisions are made. Ankuash and Resl pose for a photo in Ecuador after the Esri User Conference. The passing years have also brought changes to Resl's life. Besides teaching workshops to the indigenous students through AmazonGISnet, he's an adjunct professor, teaching geography and GIS at the Universidad San Francisco de Quito. He's also the program director of UNIGIS in Latin America in collaboration with the University of Salzburg, a distance learning program that offers certificates and diplomas in GIS and postgraduate degrees in geographic information science and systems. He is also helping to lead an initiative to build a modern cable car system between Quito and the new, growing communities in the Tumbaco Valley in an effort to help ease traffic jams on roadways, provide a high-quality public transport system at a low cost, and decrease pollution. Cable car transportation would minimize fuel consumption and, "with that, the impact of [the] oil industry in [indigenous] territories," Resl said. "Domingo [Ankuash], already mentioned to the city authorities that if they don´t proceed with the project soon, he would take the lead with the Austrian cable car partners to build a transport system for his people over the canopy in the Cordillera del Condor [mountain range]," Resl said. The system would connect Ankuash's people and communities and, said Resl, help them "avoid the construction of roads and the destruction that comes with them, and show independence from the mining companies."